Just stopping in to post a few things...I always have more to post, just need to find the time. I have long days that start very early and end late. I should be sleeping right now, but I'm compelled to post. Never want to go too long without posting. 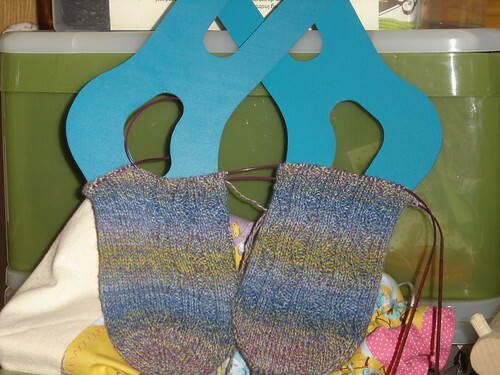 Here's whats ON and OFF the needles. 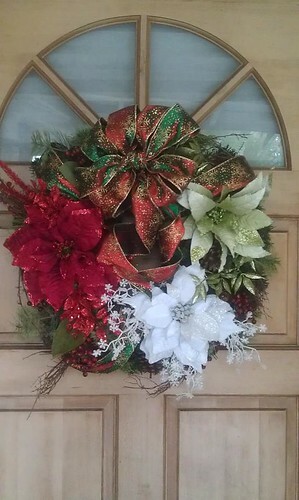 In other craftiness, I made a new Christmas Wreath to hang on my door. I like it, but I think the flowers are too big. Oh well, it'll do. 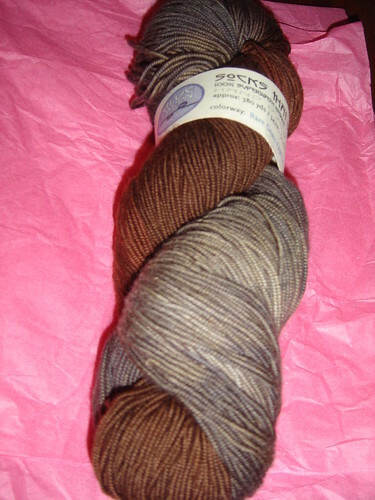 In the spirit of "Small Business Saturday", I mosied on down with my Mother to Green Planet Yarn to score some yarn for the annual "Black Sale". The haul was all my Mother, she got 20% off the entire purchase and got a great deal on some 100% Trauco Cashmere at 55% off. 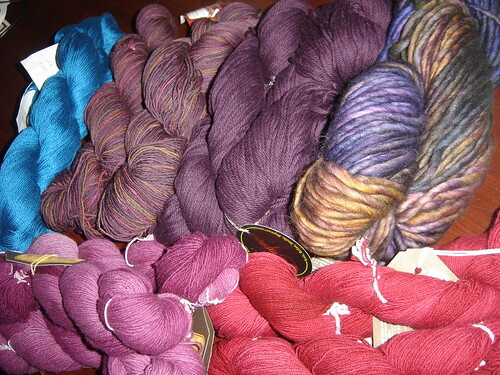 It's such a lovely yarn, in the picture it's the 5 skeins at the bottom, in purple and wine. From right side top, we have Ultra Pima Cotton in a gorgeous Colbalt blue, Mountain Colors sock yarn in pretty varigated purples and brown hues, Cotton Supreme in a very passionate purple, Malabrigo Rasta in gorgeous purple, gold, blacks, and lastly the 5 skeins of Trauco Cashmere in purple and wine. 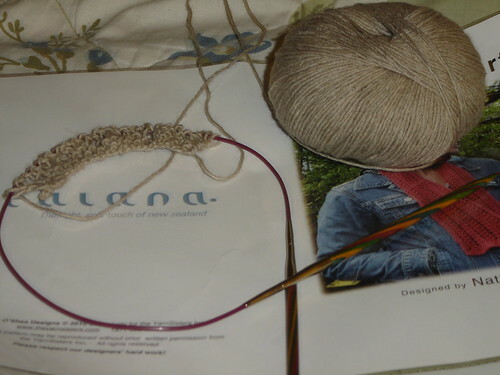 So it begins, the gift knitting, I know its a late start but I always like challenges. 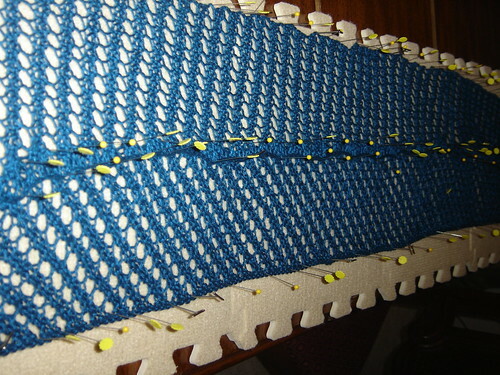 I'll end up with 5 long Moebius cowls and a pair of gloves and then something more. 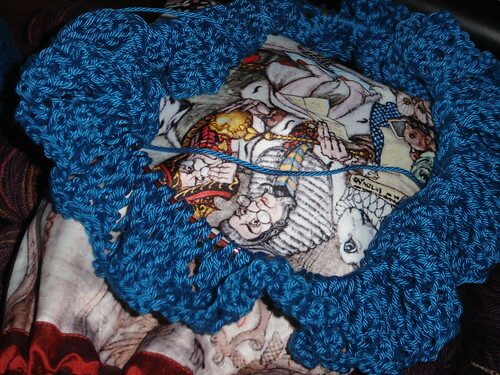 The more is a few skeins have undecided fates, but that shall change soon. 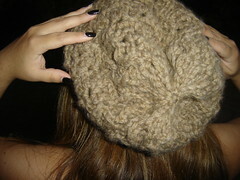 I'm actually making these items for gifts for my Mother to give, so I'm giving the gift of knitting. 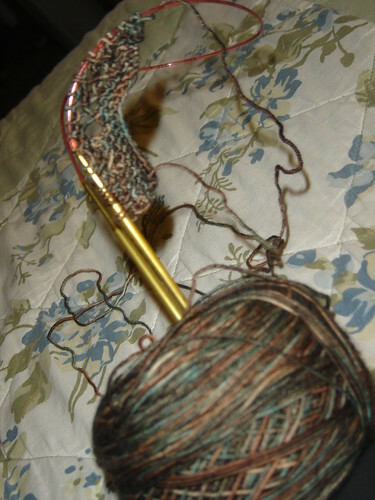 8) Although thats not considering I get to pet, squish, and knit with the yarn, always nice. 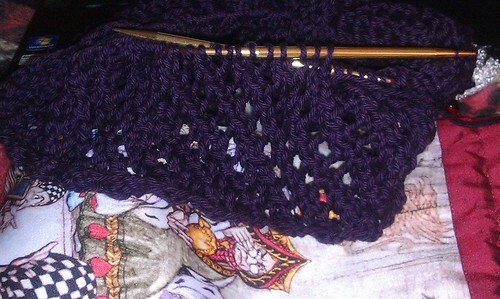 Here's one of the cowls already on the needles. 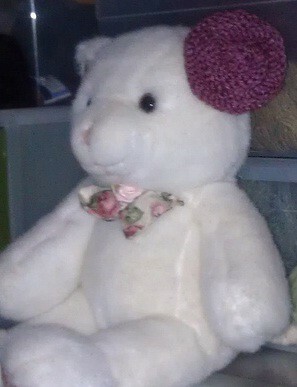 I better get going now, have alot of busy things to do, including knitting. November turned out to be a busy month for me and before I knew it Thanksgiving was here. 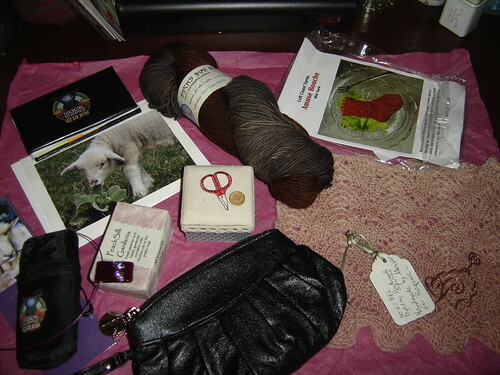 I know that I received 2 great packages, from a wonderful swap spoiler, Palehouse on Ravelry, and from a close friend, Marisol. Palehouse sent me my swappy package from the Love Bites swap, a vampy themed swap. 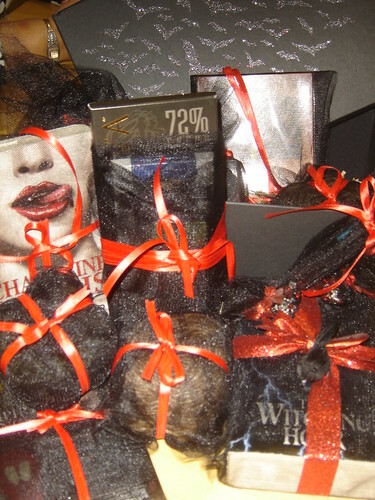 She gave me the coolest vamp package. Check out these goodies I received! First the packaging, this is what I found when I opened the USPS box.. It's you standard photo storage box, but an awesome one. 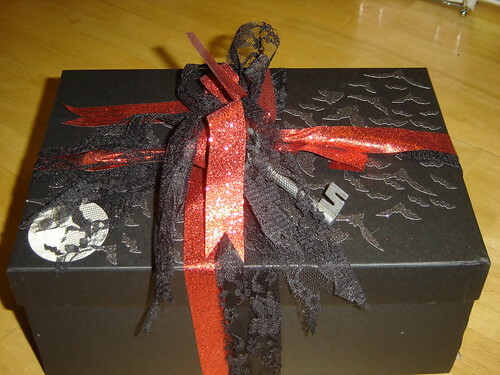 With bats and a glow in the dark moon, and some cool ribbon with a steel key. I was totally geeking out over the packaging, its the simple things that I love. 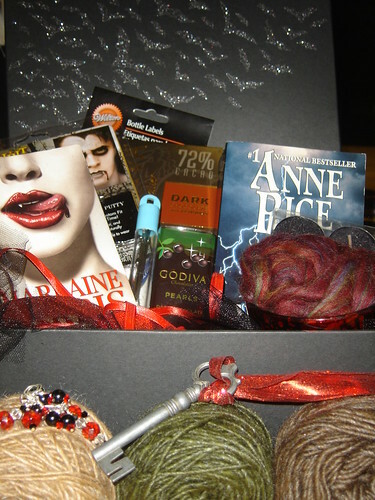 Such great gifts and beautiful yarn! 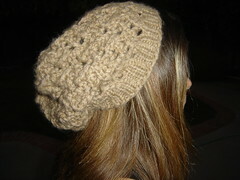 I still haven't decided what to do with the yarn, but I'm excited for when I find a pattern. 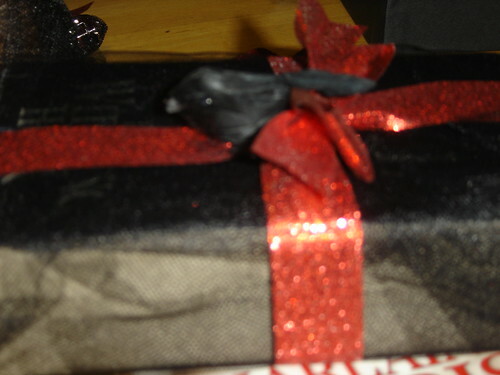 Oh, and on the outside of the wrapped Witching Hour book by Anne Rice is this totally cute black Raven! My second package received, such a surprise, from Marisol. A belated birthday present, she really knows how to spoil me and knows my tastes, well our tastes are the same, makes it even better! I decided to take part in the National Blog Posting Month so there will be alot of posts from me this month, if I'm able to stick with it. 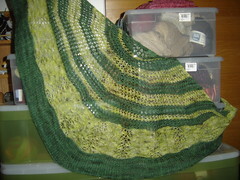 Today's share is a finished Cerasifera shawl, not the best picture to be sharing but it'll have to do for now. Maybe I can get a quick photo shoot done this weekend. 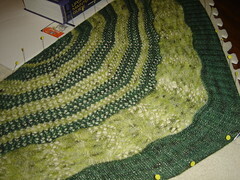 Here's a cool blocking photo, for some reason I just love blocking photos? Do you? It's nice to see how each person blocks their FOs, it's really a science to block a finished item. 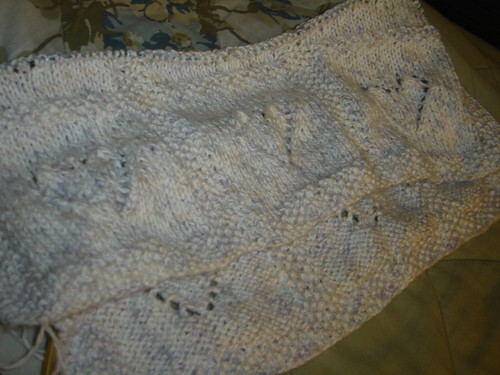 This shawl was particularly fussy to block, the rounded edge was a bit tricky to block out the shawl to measurements. 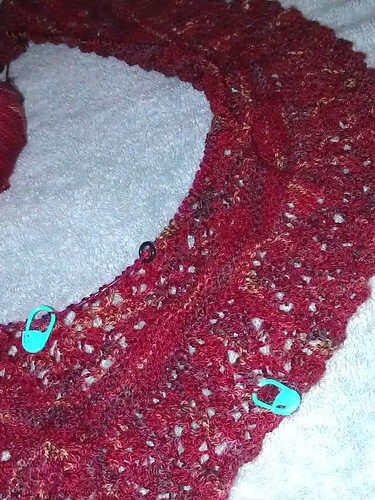 I'm always happy when shawls block to the designers measurements. 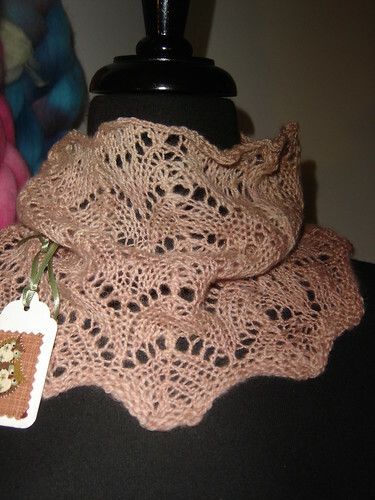 tagged cerasifera, national blog month, through the loops, throughtheloops in 2011, FO's!